-Only character so far with an OTG attack, letting him hit the opponent after a knockdown. -Can easily throw the opponent into a corner with Irish Whip. -Strong mix-up game thanks to Rocket Run. -Defense is quite weak and he has no way of getting the opponent off of him outside of his guard attack. -Damage is a bit weak outside of his OTGs and grabs. -Both special and super grabs aren't near instant, making them easier to jump over. Body Splash (Down + Punch while moving backwards or forwards; Air Only) - Name says it all, useful cross-up attack. Rocket Run (D, DF, F, Punch or Kick) - Star Man makes a run towards the opponent. Star Man runs rather fast and has a bunch of follow-ups. If he makes contact with the opponent during the run, he'll smack into the opponent and fall over, knocking them over as well if they didn't block. Skidding Stop (Back) - Star Man skids and stops in place. He also does this if he runs past the opponent. Flying Cross Chop (Punch) - Star Man preforms his signature flying cross chop. Star Man is safe on block although this does the weakest damage out of all of his attack follow-ups. On whiff, Star Man fall over onto the ground. Knee Launch (Select) - Star Man jumps up with his knee out. Anti-air option (although acts as more of an air-to-air) and the strongest option. However, Star Man is unsafe on block. Alternatively, this could be used as a way to hop over projectiles since Star Man recovers the instant he touches the ground. Thruster Slide (Down) - Slide kick attack that travels half-screen. This causes a hard knockdown and the hitbox is short enough to slide under mid-projectiles. Unsafe unless it hits at max distance. Knee Landing (Up) - Star Man jumps up and then comes down with his knees out. Needs to be blocked high and is safe on block. The startup is rather noticeable as well. This can also go over projectiles although it doesn't travel as far as Knee Launch. Shooting Slam (B, DB, D, DF, F, Punch or Kick) - Star Man jumps forward to body slam the opponent, knocking them into the ground on contact. This attack has the additional ability to hit downed opponents. Kick version travels a little more than half-screen distance, making it a bit more applicable for going over projectiles. However, Star Man is unsafe on both whiff and block. Irish Whip (F, D, DF, Punch or Kick) - Blockable 8-frame command grab. Star Man grabs the opponent and throws them into the wall. When the opponent hits the wall, they stop and become stunned for a bit. This move can combo from his basic attacks but the opponent has to remain close to Star Man in order for it to combo properly. The range is slightly less than the punch version of Sommersault Kick. If used a second time in the middle of a combo, the opponent won't be left stunned upon hitting the wall. Punch version throws the opponent fowrards, Kick version throws them backwards. EX Rocket Run (D, DF, F, Punch and Kick) - Gains two hits of super armor during the run. The armor gets dropped if he uses any attacks. (Skidding Stop will retain the armor) He also doesn't smack into the opponent during the run. Can use this to run through projectiles and can kind of be used as a reversal albeit unreliable. EX Sommersault Kick (F, DF, D, DB, B, Punch and Kick) - Range is the same as the kick version but it does more damage and has throw invincibility. EX Shooting Slam (B, DB, D, DF, F, Punch and Kick) - Acts like the punch version but upon landing, Star Man picks up the opponent back up while they're stunned. If used again in a combo, the opponent doesn't remain stunned as they're picked back up. EX Irish Whip (F, D, DF, Punch and Kick) - Becomes an unblockable command grab but loses the ability to chain into from a basic attack. Star Man throws the opponent forwards and when they hit the wall, they run back to Star Man. 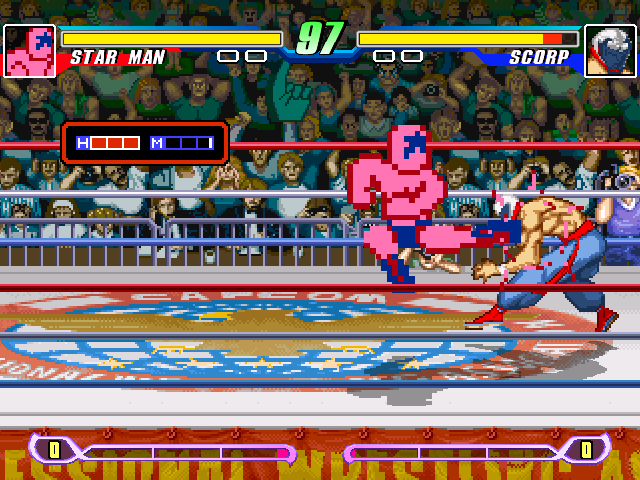 If Star Man doesn't do anything, the opponent will smack into Star Man and they'll both fall over. Orbital Swing (Level 1) (360, Punch) - Star Man grabs the opponent, preforms a giant swing and then throws them into a wall. He then jumps up, grabs the opponent in a headlock and slams them down. Grab has 4 frames of start-up, making it easy to jump out of but Star Man is invincible during the startup. Meteor Crash (Level 1) (D, DF, F, D, DF, F, Kick; Air Only) - Star Man dives downward, surrounded by energy. During the dive, Star Man is completely invincible but upon landing, he tumbles forward, leaving him to be punished. Star Man can also cancel this from his Air Light Punch, Air Light Kick and Air Strong Kick. Comet Tackle (Level 1) (D, DF, F, D, DF, F, Punch) - Star Man flies forward with a flying cross chop and on hit, he shoves the opponnt into a wall and preforms a series of attacks. This is his main combo ender and will shove the opponent straight into the corner. He's also invincible during part of the tackle. On block, he rebounds off and is unsafe. Lift-Off (Level 3) (D, DF, F, D, DF, F, Punch and Kick) - Star Man dashes forwards, grabs the opponent, tosses them up into space and flies into them several times. He then proceeds to grab the opponent and drops back down into the stage, slamming them. Star Man is invincible during the whole dash but the move can easily be jumped and Star Man's unsafe on both block and whiff. Fantastic! I absolutely love Starman, got hit by the nostalgia train, HYPE! Is it just me, or is Starman just a little too short in this game? Star Man from Pro-Wrestling now has a standalone M.U.G.E.N version! He's scaled up (with a file to resize him back) and comes with a configurable file! He also has received several balance and mechanic changes that will be implemented into the next update of Famicom Fighters! This also contains the balance/move changes that will be implemented in the next FCF update. FCF characters are no longer invincible upon getting up, hard knockdown get up state was re-implemented. Fixed Lift-Off not forcing FCF characters to lie down.